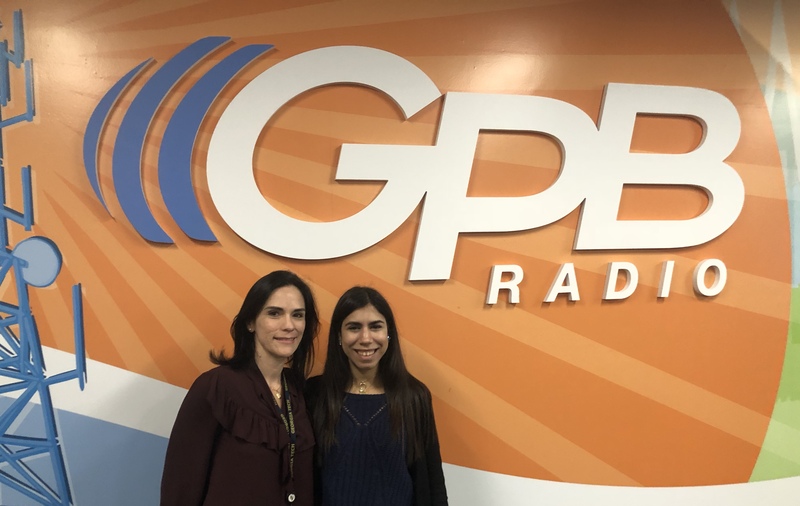 Visit follows Georgia Tech offer helps Hurricane Maria-affected entrepreneurs and researchers from Puerto Rico tap into Technology Square’s innovation ecosystem. As a third-year biomedical student at the Interamerican University of Puerto Rico, Jamily Ali Pons has been studying how parasites affect the monarch butterfly’s life cycle. But Hurricane Maria, the costliest storm to ever hit the U.S. island territory, wrecked her research and lab facilities when it hit Puerto Rico, Sept. 20, 2017. Now — after recently spending a week at the Georgia Institute of Technology — the 26-year-old San Juan native, said she’s broadening her sights beyond research and thinking about commercializing her findings. Ali Pons’ visit to Georgia Tech followed the Institute’s offer to host entrepreneurs and innovators from Puerto Rico still affected by the deadly storm to continue their work here temporarily in Technology Square. The Economic Development Lab (EDL), program of Tech’s Enterprise Innovation Institute, has been a partner to various universities and economic development organizations on the island since 2012. EDL is able to offer use of the space temporarily to Ali Pons and others via the Georgia Advanced Technology Ventures Inc., a non-profit organization and Tech affiliate. 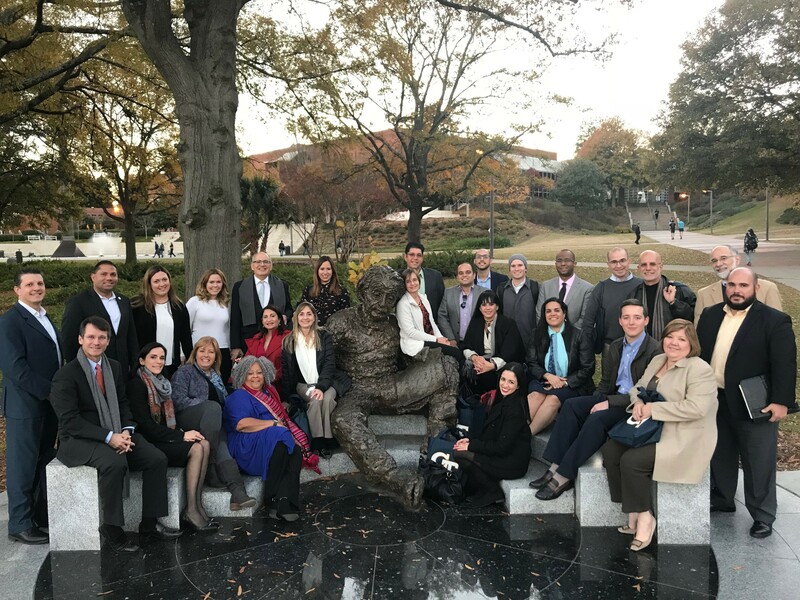 The initiative followed a November 2017 visit to Georgia Tech by a delegation of the Echar Pa’Lante (Move Forward), a multi-sector alliance based in Puerto Rico and comprised of business and government leaders and educators. Mónica Novoa, a project manager at EDL, said the offering is part of its ongoing work in Puerto Rico since 2012, when a team from the Institute went to the island to conduct a full assessment of its innovation ecosystem in a government-funded study. “Our initial work with that study and what we’re doing now has been centered around the role of universities in developing entrepreneurial programs and to teach how to be innovative and creative from that standpoint,” Novoa said. That initial assessment led to EDL partnerships with two non-profits Grupo Guayacan and Echar Pa’lante to implement a host of programs funded by various organizations. Startup bootcamps for 80 entrepreneurial teams. Successful teams have raised $5 million in capital. The launch of the island’s first-ever seed fund, which raised a $1 million. Building one of the first mentor networks. Supporting the University of Puerto Rico licensing its first securing the first license technology in its history. Trained over 400 faculty and ecosystem members in lean startups techniques. Supporting a $40 million research grant in cell manufacturing technologies for a consortium of partners that includes Georgia Tech, Emory University, and the University of Puerto Rico-Mayaguez. Caribbean island recovers from Hurricane Maria’s devastation. 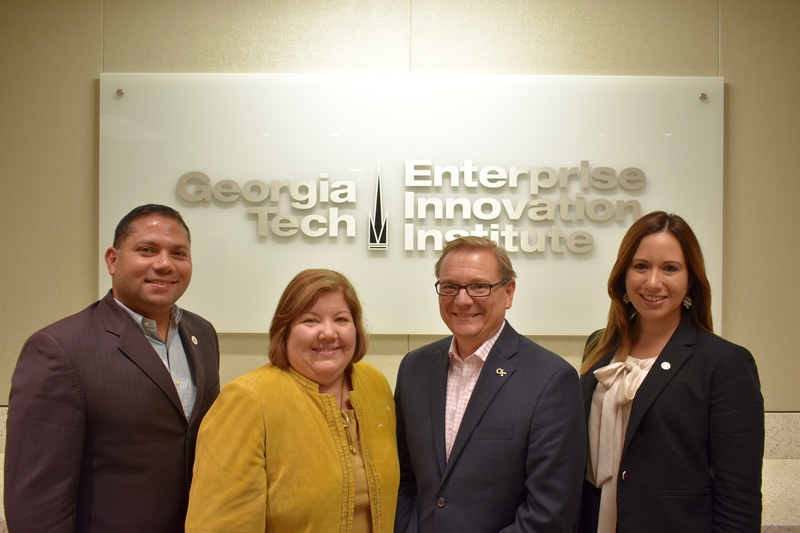 A delegation of business and education leaders visited the Georgia Tech campus recently to learn about the Institute’s economic development initiatives and programs. The Georgia Institute of Technology will offer more than 2,000 square feet of office space — for a four-month period beginning in February 2018 — to entrepreneurs and innovators from the island of Puerto Rico, who are still reeling from the devastating effects of Hurricane Maria. The Institute will host up to 10 companies — roughly two people each — in Class A office space during that four-month period. The space offering is made possible via Georgia Advanced Technology Ventures Inc., a non-profit organization and Tech affiliate. Eligible entrepreneurs are encouraged to apply during the offering period via this link: https://goo.gl/N3Rst8. The initiative follows a November 2017 visit to Georgia Tech by a delegation of the Echar Pa’Lante (Move Forward), a multi-sector alliance based in Puerto Rico and comprised of business and government leaders and educators. David Bridges, director of Georgia Tech’s Economic Development Lab (EDL), the program that hosted the delegation, said the offering follows years of work with partners on the island to develop Puerto Rico’s startup ecosystem. EDL, a program of Georgia Tech’s economic development arm, the Enterprise Innovation Institute, assists governments, communities, foundations, entrepreneurs, and small businesses in fostering value creation by applying innovative ideas, technology, and policy to initiatives focused on fostering economic growth. The temporary space offering follows more than five years of work EDL has done in partnership with universities, private organizations, non profits, and the Puerto Rican government in building the innovation and entrepreneurial ecosystem of the island. Through those longstanding efforts in Puerto Rico, EDL’s work with its partners on the island has resulted in more than $9 million in initiatives and investments being infused into the island’s startup ecosystem. The delegation of more than two-dozen visitors to the Tech campus included Gloria Viscasillas, Banco Popular of Puerto Rico’s vice president of economic development programs and Echar Pa’Lante leader, Silvio López (BSCE ’79), Banco Popular senior vice president, Walter Alomar, president of the Universidad de Puerto Rico’s board of directors, and Glorimar Ripoll, the island’s chief innovation officer. Alomar and the other delegates were on campus Nov. 27 and 28 to learn about the Institute’s innovation and entrepreneurship ecosystem and its impact on metro Atlanta and Georgia’s economic development. They also learned about the various components that comprise a successful innovation ecosystem model. On Sept. 20, 2017, a category 4 storm, Hurricane Maria, hit Puerto Rico. The ensuing 155-mile-per-hour winds and catastrophic flooding destroyed the island’s electrical grid and plunged it into darkness. The natural disaster came as the island was already dealing with a debt crisis of more than $73 billion. 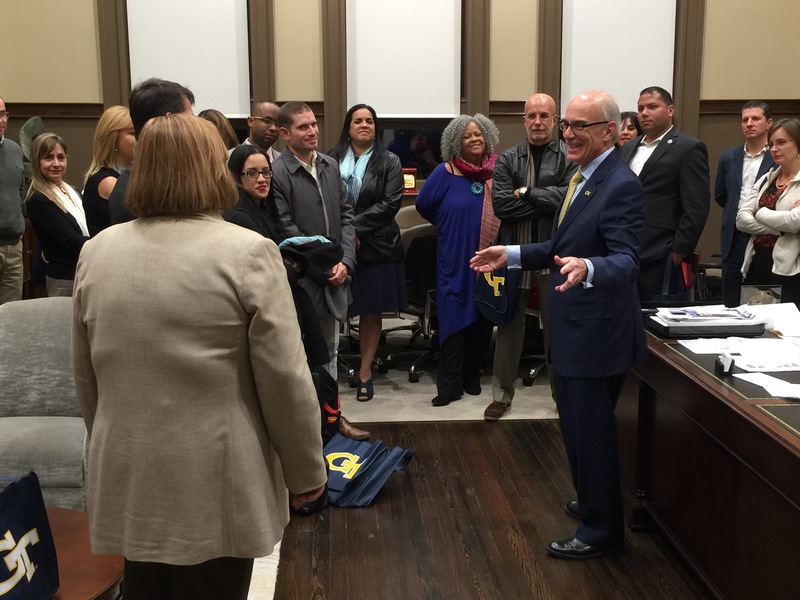 The visit to Georgia Tech and temporary space offering is part of a strategy to support Puerto Rico’s economic recovery. The University Allies of Echar Pa’lante, a Banco Popular effort, established a goal to work together on an initiative called the “Block Project.” Under that project, EPL Universities Allies will collaborate to support entrepreneurs and create economic development activity in the communities that surround university campuses across Puerto Rico. EPL launched a partnership in 2015 with Georgia Tech to train 800 university professors on evidenced-based entrepreneurship. The long-term goal is that EPL-member schools, which include Universidad de Puerto Rico–Mayaguez and the Universidad Interamericana de Puerto Rico, will collaborate to create economic development activity adjacent to their respective campuses. During their visit to Tech, the delegates met with Provost Rafael L. Bras, among other campus leaders, and toured a number of Institute programs and facilities, including the Invention Studio and the Advanced Technology Development Center (ATDC). They also met with leaders from corporate innovation centers at Tech and received an update on the National Science Foundation’s (NSF) $20 million engineering research center project. Led by Georgia Tech, the NSF Engineering Research Center for Cell Manufacturing Technologies (CMaT) includes a group of universities — Universidad de Puerto Rico–Mayaguez among them — that will work closely with industry and clinical partners to develop transformative tools and technologies for the consistent, scalable and low-cost production of high-quality living therapeutic cells. The CMaT and project as well as the Economic Development Lab’s efforts underscore the longstanding ties between Georgia Tech and Puerto Rico. The relationship goes back to 1895, when the Institute accepted the first group of students from the island, then under Spanish rule. Most recently, in 2016, Tech conferred 20 degrees to students from Puerto Rico, and there are currently 62 students enrolled at the Institute. “We are particularly interested in understanding the role that a university, such as Georgia Tech, plays in economic development and how it has specifically helped to accelerate and strengthen the entrepreneurial ecosystem here,” Viscasillas said. Economic Development Lab, an economic development program of the Georgia Institute of Technology’s Enterprise Innovation Institute, helps communities and organizations apply innovative ideas to economic development. Areas of expertise include business incubation and commercialization, strategic planning, and economic sustainability. EDL helps communities create jobs and become more competitive, by advancing innovation-led economic development by providing expertise and connections to Georgia Tech research and resources. For more information, visit edl.gatech.edu. The Enterprise Innovation Institute (EI2) is the Georgia Institute of Technology’s economic development unit. 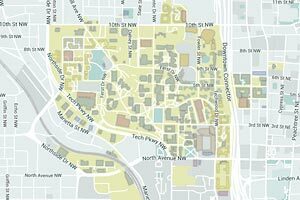 It is charged with fulfilling Georgia Tech’s mission and goals of expanded local, regional, and global outreach. EI2 is the nation’s largest and most comprehensive university-based program of business and industry assistance, technology commercialization, and economic development. EI2 is creating the next innovation economy, not only for Georgia, but beyond. EI2’s expertise and reach are global in scope, with its programs in innovation, entrepreneurship, and ecosystem development serving governments, universities, nonprofits, and other organizations worldwide. To learn more, visit innovate.gatech.edu.